Wreaths are a beautiful decorative item that you can easily hang to celebrate a season or holiday. They are particularly popular for Christmas, of course, and are increasingly popular as general fall decor. Spring wreaths are also gaining in popularity. You can use wreaths all year long to brighten up your home. Crochet wreaths are fun to make, can be given as gifts and look terrific on display. Here are some free wreath patterns for you to use. This free crochet tutorial from Crochet Concupiscence shows you how to make three different types of crochet bows to adhere to the outside of a grapevine wreath as well as how to add a beautiful double-stranded thread crochet mandala to the center to make the wreath really stand out. Sarah Zimmerman of Repeat Crafter Me created this free wreath crochet pattern to celebrate all that is wonderful about the autumn season - from the changing colors of the leaves to the popular pumpkin motif. The pattern is simple enough that you could alter the colors and change the pumpkins out for other appliqués and it would easily adapt this free wreath crochet pattern into a design suitable for any other occasion. Think pastels and bunnies for spring and red, white and blue with stars for 4th of July. Notably, Repeat Crafter Me also has a really cute Spring Crochet Wreath Pattern. This free crochet wreath pattern from Donna's Crochet is another terrific fall decor item. It's inspired by candy corn, the perfect sweet treat for Halloween but also a candy with colors that suggest all of the months of autumn. Again, this is adaptable to other colorways for other holidays. This free crochet pattern from Whiskers and Wool makes a classic Christmas wreath in a small size to be used as an ornament or even a gift tag appliqué. 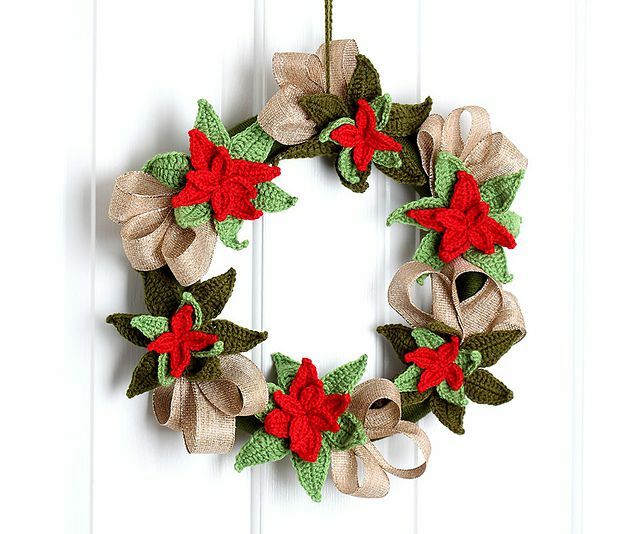 You could adjust the ring size and scale up the instructions to create a larger crochet Christmas wreath. And you could alter the yarn colors to make wreaths for different holidays. Anyone seeking a full-sized classic Christmas wreath crochet pattern can find a diverse array of options through sites including Ravelry. This one, a free crochet pattern from Made by Murray, is a simple beginner's crochet Christmas wreath that works up beautifully. This is a slightly more advanced free crochet wreath pattern for Christmas. It's from Yarn Twist and is available as a Ravelry download. The crochet poinsettia flowers are made in different colors and added to a wreath surface to create the quintessential Christmas decor. Poinsettias aren't the only flower that looks great on a wreath. In fact, add a set of any type of crochet flower to a ready-made craft wreath and you'll have a wonderful spring wreath for display. This Blooming Spring Wreath Mulberry Wreath by Sustain My Craft Habit is a great example of a floral crochet wreath free pattern. Here's one more example of a floral crochet wreath pattern. Like the poinsettia pattern above, the entire wreath is covered in crochet. Like the flower wreath above, a set of flowers adorns only one section of the wreath. Worked in a sophisticated color palette, it's a great modern crochet Christmas wreath and can be re-utilized throughout the year as well. Magical butterflies on a colorful background adorn this lovely free crochet wreath pattern from Crochetier. You could also forget the butterflies and just use the simple instructions for a striped crochet wreath in an array of colors.